Mushroom hunting and picking wild mushrooms is a fun and rewarding activity. However, for a beginner, getting started comes with a list of questions. Although this post won’t answer all of your questions, it should be a great primer for getting started hunting wild mushrooms. If you are here only for Pennsylvania Mushroom Hunting and Picking Regulations on Public Lands, you can jump right to that section. Cover Image by Jeff Gee – Laetiporus, Chicken of the Woods – Many say these taste like chicken and the mushroom can be prepared in most ways that one can prepare chicken meat. One interesting note, per Wikipedia, in some cases eating the mushroom “causes mild reactions . . . for example, “swollen lips” or in rare cases “nausea, vomiting, dizziness and disorientation” to those who are sensitive. This is believed to be due to a number of factors that include allergies to the mushroom’s protein or toxins which are only somewhat stable at high temperatures. 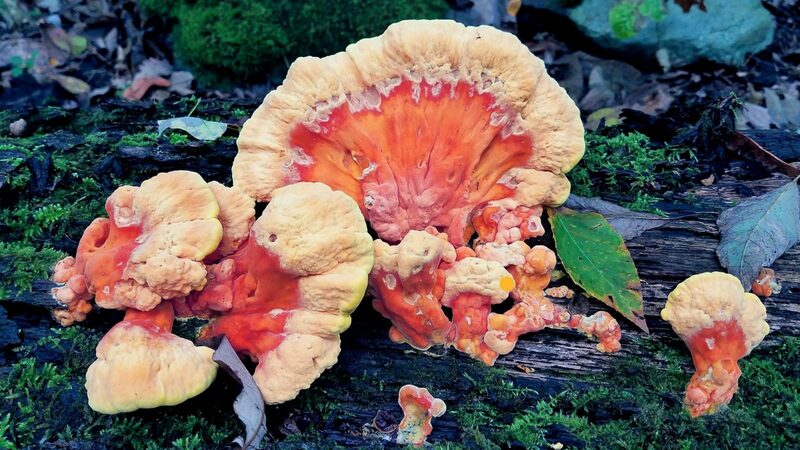 As such, many field guides request that those who eat Laetiporus exercise caution by only eating fresh, young brackets and begin with small quantities to see how well it sits in their stomach. One of the most common questions about mushroom hunting surrounds identification. This is probably due to a fear of getting sick or worse when picking and eating foraged mushrooms. There is a long standing anxiety surrounding mushrooms. I believe this is simply due to a mystique that has evolved over millennia. Mushrooms represent a very large yet relatively unknown subset of flora on our planet. Let’s try to demystify. Inky caps are considered edible mushrooms. However, when you read about them, you will learn they do not mix well with alcohol. They have chemicals in them that can mix with alcohol and create some unwanted side effects. This is my first tip that can steer you in the right direction. Start out by simply locating mushrooms and trying to identify them without picking anything. This alone is fun and rewarding. I have rarely, if ever, taken a walk in nature and not found at least one mushroom. There are thousands of species, some rare and exotic, some common. Get your sea legs first. Then you can think about picking and eventually eating wild mushrooms. One of the north east’s truly deadly mushrooms. The Destroying Angel will kill you if you eat it. It is so white, it seems as if it is glowing. Seek second opinions from other mushroom hunters. Never rely only on someone else’s identification. How to identify wild mushrooms? Both the text description and photos of mushrooms should be used to identify. Small variations and details that aren’t easily seen in a photo can easily be described in the text. Each book has its own list of pros and cons. For this reason, having a few to rely on will be beneficial. Each book has its own process for identification. Most books are regional. So, your first step will be to get a mushroom hunting book that fits your needs! Another question that often arises is regarding where you can legally pick mushrooms. 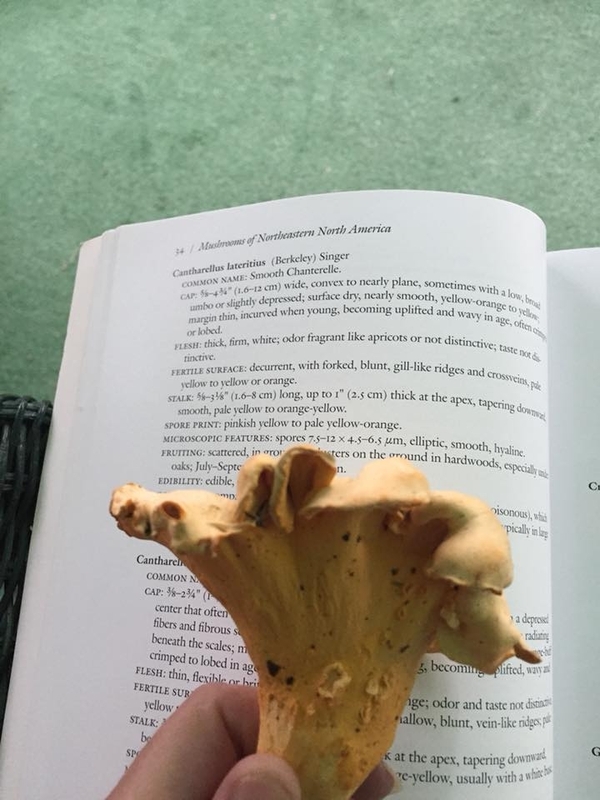 Where can I pick wild mushrooms? There are many locations where you could hunt and pick wild mushrooms. 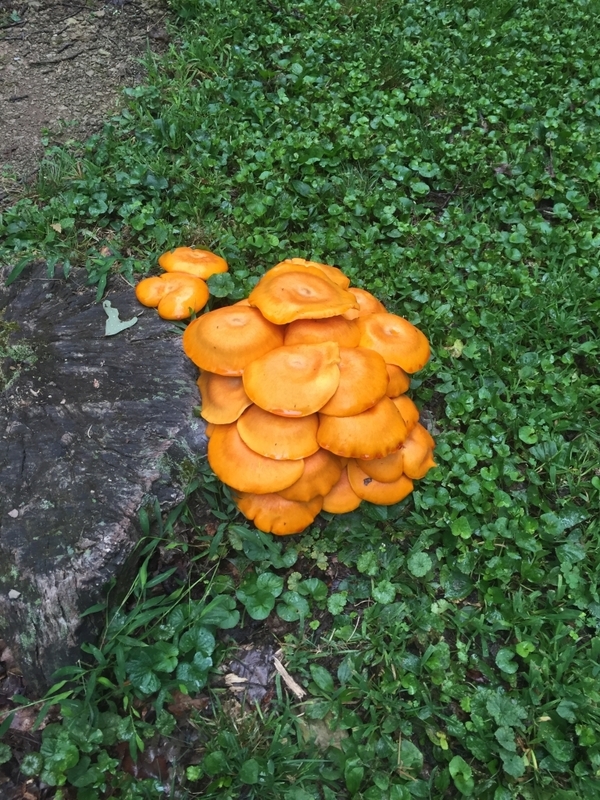 You can find mushrooms in your own back yard and along city streets. However, for the most diversity and quantity of mushrooms, you often need to look toward undisturbed areas. 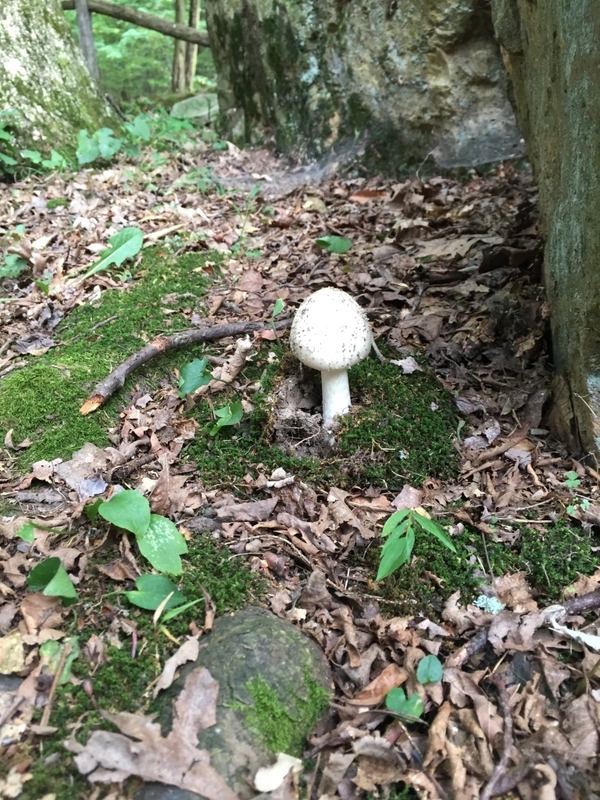 Variations in topography and the unique ecology of a given location will determine the success of your mushroom hunting. The presence of favorable micro climates and symbiotic plant species (trees) tend to be a big factor in finding mushrooms. Wild places like large forests offer access to these favorable conditions and in turn the most mushroom hunting success. Much of that wild land, especially on the east coast, is private land. Farm land, wood lots, and large tracts of private land are everywhere. Private property is strictly off limits. You must first seek permission from the land owner before entering private property. If not, you are trespassing and stealing (if you pick). In some cases you will be surprised by the answer if you ask a land owners permission. This is especially true if you agree to share your findings and/or the bounty (if you pick)! Every county tends to have a GIS system where you can find property and land owners with contact info. The easiest way to find your county’s GIS is probably via a google search. Using the interface and navigating is a whole different story. My recommendation is to start by asking friends or family about their private land and seek permission there. Public lands, like state forests, game lands, and parks are also plentiful. There are plenty of maps and resources that will help you find public lands. In Pennsylvania, DCNR provides interactive maps and downloadable content showing you exactly where you can find state forest lands. State Game Land maps can be found here. Here, you can find state parks by region. A quick search will most likely turn up similar resources in your state. Knowing where you can legally visit, mushroom hunt, and pick can save you a lot of trouble. Being in the wrong place could result in fines, dangerous encounters with protective land owners, and, in some cases, even jail time. Before we dive into the details of where you can legally hunt and pick mushrooms in Pennsylvania, let’s quickly cover some basics about being in the wilderness. There are a whole host of tips, tricks, recommendations, safety precautions, and laws pertaining to visiting and exploring wild lands. I can’t get in to all of that here. I will say, if you are not an avid outdoor seeker, you may want to enlist the help of someone who is. If you don’t have an outdoor adventurer on hand, don’t be dismayed by this warning. Many of these public lands have easy access and you can stay on trails, near civilization. Here are a few simple guidelines that can prevent any number of potential dangers. Some easy rules to stay safe: Don’t wander off trails (At first, but as you gain experience, your best mushroom spots will most likely be “off the beaten trail.”), walk with purpose and be perceptive of your surroundings, don’t go out near or at night (take a flashlight anyway), always take a buddy, always take some water, tell someone (who isn’t going with you) where you are going and when you expect to return, look at a map prior to going out and take a map with you, don’t rely on your mobile phone, service may be spotty and batteries die. The US Forest Service has a nice resource on wilderness safety here. Pantherophis obsoletus – also known as the western rat snake, black rat snake, pilot black snake, or simply black snake. 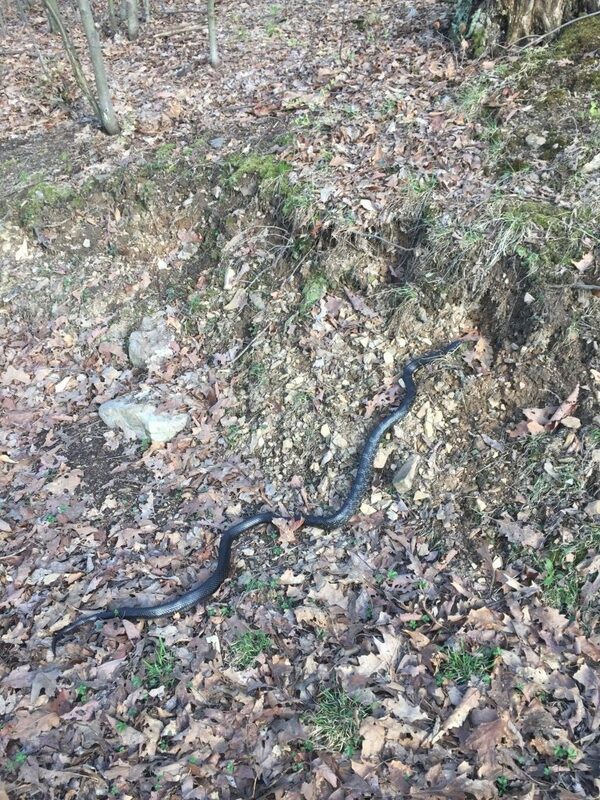 This one is about 7 feet long and found in the Central Pennsylvania wilderness. Another consideration when visiting public lands for mushroom hunting is game hunting. As I write this article, here in Pennsylvania, archery is almost upon us. Many outdoor enthusiasts of another kind will be flocking to these same public lands with deadly implements in hand, looking to bag some game. You typically don’t want to go stomping around on game lands or state forest during any hunting season. It’s not necessarily illegal, but it is more of a safety and consideration choice to stay out of the woods during hunting seasons. People have inadvertently been killed in the woods by being mistaken for game. Hunters, who have an equal love of their hobby, wait all year to go out. By the way, many of these hunters are also looking for mushrooms! Your disturbance of the woods is at the very least inconsiderate. Imagine if someone went to your prime mushroom hunting spot and trampled the biggest patch of Morels you had ever seen? How would you feel? What if you met that person and you happened to be holding a deadly weapon. It’s not a cocktail I want to taste. 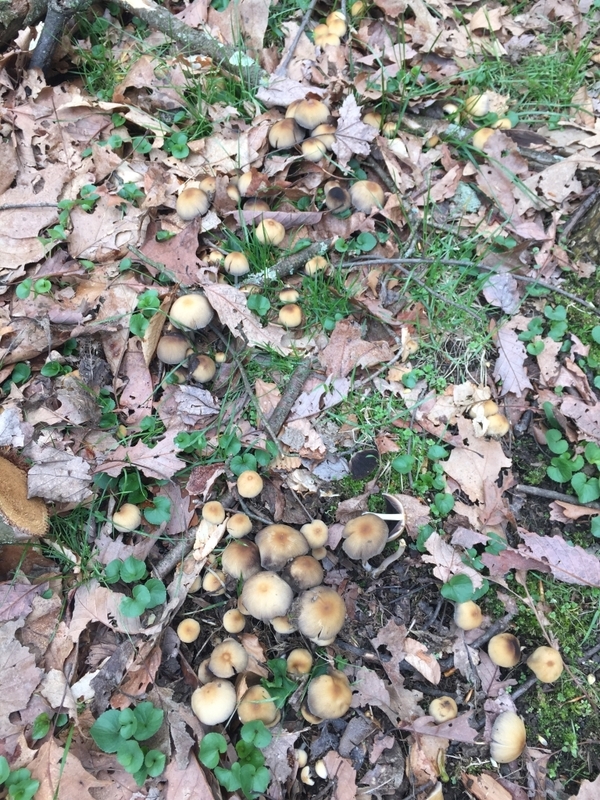 One nice thing about Pennsylvania for mushroom hunting, although avid game hunters may not see it this way, almost all hunting is prohibited on Sundays. So, no matter the hunting seasons, Sunday tends to be a good day to mushroom hunt on game lands and in state forests. Your state may have similar regulations or opportunities to pursue your hobby alongside other outdoor enthusiasts. Many private conservation lands, although open to the public, have strict rules about removing and disturbing anything. They would have the right to prosecute you if you take things (mushrooms). These lands can include various types of parks, campuses, conservancies, and preserves. Again, asking an organization’s permission may be all it takes to gain access to pick. Simply visiting and hunting mushrooms is typically fine. However, these types of lands sometimes require you to stay on designated paths and trails. That can limit your findings. 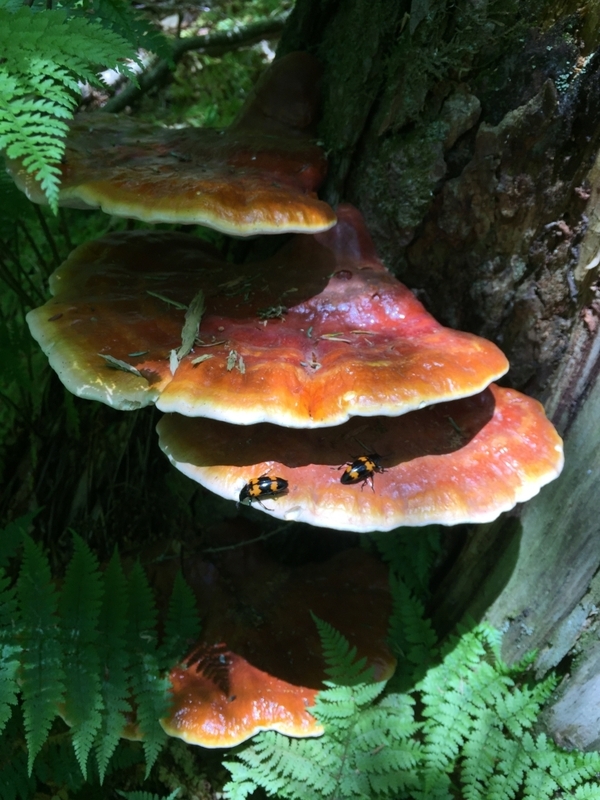 Found deep in some of the last old growth hemlock forest on the east coast, large Reishi Shelf Mushrooms are touted for their medicinal properties. There are any number of other categorized lands like federal and municipal lands. Most county and community parks are fine for hunting, yet picking may be off limits. These lands will require your own research. What I really want to focus on are the regulations surrounding State Game Lands, State Forests, and State Parks. The below guidelines are specific to my state of Pennsylvania. Your state’s laws may be different. However, with some quick searching, you can find similar statutes. For instance, I just searched “California State Park Regulations” and after two clicks, I found what I was looking for. “No person shall willfully or negligently pick, dig up, cut, mutilate, destroy, injure, disturb, move, molest, burn, or carry away any tree or plant or portion thereof, including but not limited to leaf mold, flowers, foliage, berries, fruit, grass, turf, humas, shrubs, cones, and dead wood, except in specific units when authorization by the District Superintendent or Deputy Director of Off-Highway Motor Vehicles to take berries, or gather mushrooms, or gather pine cones, or collect driftwood is posted at the headquarters of the unit to which the authorization applies.” So, it seems each state park in California regulates mushroom hunting individually. Try searching for things like “State Park Regulations,” “State Forest Regulations,” and “State Game Land Regulations” for your state. Now, let’s talk specifically about Pennsylvania’s regulations. I am not a lawyer or necessarily an expert on these laws, so take this as is. Per the statutes for game lands, state forests and state parks in Pennsylvania, there are clauses about picking mushrooms. First they say you can’t pick. But, they quickly outline what is exempt and permitted. State game lands have one set of regulations, state forests have another, and finally state parks a third. One clear distinction is that picking, which is allowed, is for personal use only. Any commercial activity, selling what you pick for instance, is governed totally differently. (2) Plant, gather, cut, dig, remove or otherwise injure plants or parts thereof, including trees, shrubs, vines, flowering plants, cultivated crops, mushrooms and fruits of berry-producing plants. or in part, a living or dead plant, vine, shrub, tree or flower, including fungus, lichen and moss, except as permitted in subsection (b) and §21.120 (relating to ground blinds and tree stands). living or dead tree, shrub or plant. (1) Mushrooms and fruits of berry-producing plants may be picked. individual’s personal or family consumption, unless the plant is listed in Chapter 45 (relating to conservation of Pennsylvania native wild plants) as threatened, endangered, rare or vulnerable. (1) Gathering edible fruits, nuts, berries and fungi, in reasonable amounts, for one’s own personal or family consumption. This permission does not apply to wild plants listed in Chapter 45 (relating to conservation of Pennsylvania native wild plants) as threatened, endangered, rare or vulnerable. I tried to find any mushrooms listed in Chapter 45 but couldn’t find any. That doesn’t mean they aren’t there. However, most edible mushrooms in Pennsylvania are quite common, so it would be odd if any of those species were listed. Mushrooms can be colorful! These Jack-o-Lantern mushrooms, Omphalotus illuden, are not edible, but some people say they glow with bio luminescence at night.